The belief that Sri Lanka had been blessed by Buddha is the prime factor that motivates the Sinhala people to make Sri Lanka a Sinhala- Buddhist country. The other factor is that the Sinhalese were the first human settlers. They believe that human settlements in Sri Lanka began with the arrival of Vijaya. Tamils on the other hand believe that man lived in Sri Lanka from ancient times and Vijaya was an intruder and not the first human settler. They also believe that Hinduism was the religion of the Yakkhas and Nagas before they were converted by Buddha to Buddhism. These two belief systems form the bedrock of the Sinhala-Tamil conflict. I was 14 when the election was held for the First Parliament of Ceylon (Sri Lanka from 1972) in 1947. We were all excited when G.G. Ponnambalam, the leader of the All Ceylon Tamil Congress, moved to Jaffna, the cultural capital of the Sri Lankan Tamils, to contest the sitting member Home Minister A. Mahadeva. Ponnambalam had by then earned the image of protector of the Tamil people of Sri Lanka and his oratorical skill had enthralled the youth. “Follow me, I’ll win for you your rights and restore your dignity,” was the message he preached. He was then campaigning for ‘Fifty-fifty’, a scheme his political party proposed for a fair sharing of power between the Sinhalese who formed the majority population and the minority communities. The scheme called for the allocation of 50 percent of the number of seats in parliament to the Sinhalese and the balance 50 percent for the minority communities. He proposed that Sri Lankan Tamils, the Muslims, the Indian Tamils and others elect their representatives through communally carved out electorates. The Soulbury Commission rejected Ponnambalam’s 50-50 formula saying it was trying to reintroduce communal representation, it was complicated and unworkable and impeded the healthy progressive advance towards parliamentary self-government. Ponnambalam continued his campaign despite its rejection calling the Soulbury Constitution a Charter of Slavery. He argued the new constitution which introduced a Westminster type of parliamentary system of government would ultimately concentrate state power in the hands of the Sinhala people and deprive the minority communities of their rights and dignity. His formula would prevent such a possibility, he argued. Mahadeva who supported the Soulbury Constitution maintained that Ponnambalam’s scheme would make the Tamils dependent on the other minority groups, especially the Muslims and the plantation Tamils. He argued that the interests of those communities were different from that of Sri Lankan Tamils and Ponnambalam’s ‘solution’ would land the Tamils in a worse situation. Mahadeva said that it was better to depend on the goodwill of the majority community than on the goodwill of the other minority communities. He explained to the public that they had persuaded Lord Soulbury, who headed the 3-member Commission that drafted the new constitution, to incorporate into the constitution a series of measures to safeguard the interests of the Tamil people. The constitutional debate did not interest the voters. Ponnambalam's campaign about the rights of the Tamil people and his pledge to protect their interests moved them. His claim that the Tamils were not invaders or foreigners as the Sinhalese contended but were indigenous people with a proud history interested them. They voted for him and his party in large numbers. For us boys who did the slogan shouting and campaigning, Ponnambalam’s slogan was the tonic. We were intoxicated with his slogan: Proclaim yourself a Tamil and walk with your heads held high. The Sinhala-Tamil conflict is as old as the history of the island. It is the outcome of the mutual fear and distrust the Sinhalese and Tamils have about each other. The Tamils feared that the Sinhalese, using their majority, would deny them, deny their legitimate rights and marginalize them. The Sinhalese feared that the Tamils, using the large population of Tamils in the neighbouring Tamil Nadu, would swamp them. The Sinhalese claimed the island as their home and called the Tamils invaders and foreigners. They said Sri Lanka was blessed by Buddha thrice and wanted to preserve the island as the home of Theravada Buddhism. They said that the Sinhalese were the first humans to settle in Sri Lanka and hence the island belonged to them. They also said that the Sinhala race is found only in Sri Lanka and thus has to be preserved for the Sinhala people. “You have Tamil Nadu. Go back,” was the slogan the Sinhala revivalists shouted in the early part of the last century. The Tamil response was equally emphatic. They said that their ancestors were living in Sri Lanka when Vijaya arrived with his followers. They asserted Hinduism was practiced in Sri Lanka long before Buddhism was introduced. They avered that Tamils were also indigenous people and they need not go back to Tamil Nadu. Tamils argued that though they shared the common history and civilization with the Tamils of Tamil Nadu they had developed a separate and distinct identity as Sri Lankan Tamils. Though Tamil language is their mother tongue they had developed their own special characteristics and literature. They claimed that the Tamil they speak is pure and preserve the original characteristics of the language. Though they are Hindus, they said, they had adopted Saiva Siddantha practices as opposed to the Brahminical practices of Tamil Nadu. The Tamils of Sri Lanka wanted to preserve their distinct identity and continue to live as Sri Lankan Tamils, they argued. The Sinhala-Tamil conflict is the result of several factors: location, trade route, history and population distribution playing major roles. Sri Lanka is an island situated near the southeastern tip of the Indian subcontinent. It is separated from the Tamil Nadu coast by the Palk Strait, a shallow sea 34 kilometer wide at the nearest point. Fishermen, since ancient days, cross the Strait in less than six hours. In recent times the speedboats of Tamil militant groups cross it much quicker. 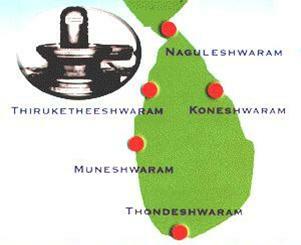 Legends and literature speak of a land bridge between Rameswaram in India and Thalaimanner in Sri Lanka. It is referred to as Rama Bridge or Adam’s Bridge. It earned the name Rama Bridge because Valimiki’s Ramayana, the Hindu epic written about 3000 years ago, says that it was built by an army of monkeys to enable Rama to cross over to Sri Lanka to rescue his wife Sita who was taken captive by Sri Lankan ruler Ravana. Valmiki’s epic was based on an oral tradition which historians claim was based on an actual event that occurred about 5000 years before the present (BP). Geologists tell a different story about the ‘bridge’. They say it was formed due to geological process that occurred 20 million years ago when the plate on which India and Sri Lanka stands collided with the Asian landmass causing the formation of the Himalayan mountain range. 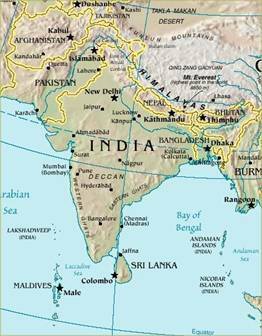 The same collision resulted in the separation of Sri Lanka from India and in the formation of the Palk Strait. Geologists add that India and Sri Lanka were connected during most of the last one million years. They become separated whenever the sea level rose due to the warming of the global climate. The two countries have been separated by the sea for the past 7000 years. The depth of the sea in the strait varies between one meter and 30 meters. Satellite pictures taken by NASA and by the Marine and Water Resources Group of Space Application Centre of the Indian Space Research Organization (ISRO) show a chain of shoals, coral reefs and a ridge beneath the sea. Reports of a NASA study speaks of the coral reef dating back 1.7 million years. A study conducted by a team from the Centre for Remote Sensing (CRS) of Bharahidasan University in Tiruchi in 2003 using modern dating techniques has concluded that the coral reefs are 3500 years old. The team headed by Professor S.M. Ramasamy studied the geological changes that took place along the Tamil Nadu coastline in the past 40,000 years. S.U. Deraniyagala, former Director-General of Archaeology, Sri Lanka says Sri Lanka was separated from India whenever the sea level fell due to global cooling and the last separation occurred 7000 years ago. Geologists say the satellite photographs show the submerged ‘land bridge’ that was once part of the land link between India and Sri Lanka. Archaeologists say there was migration of plants, animals and human beings during the periods when Sri Lanka was connected to India by land. They add that several species of plants and animals indigenous to Sri Lanka had migrated from the Indian subcontinent when Sri Lanka was connected to India. They give Sri Lankan elephant as an example. Researchers believe elephants should have migrated to Sri Lanka during the early days when Sri Lanka was connected to India. They add that the submerged ‘land bridge’ was part of the original land link between India and Sri Lanka. 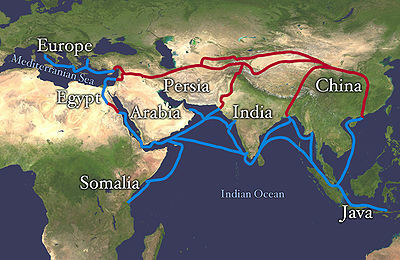 Map showing the Silk Route. Red line show the overland route and the line in blue the maritime route. Trade routes also might have played a role in the migration of human beings to Sri Lanka in the early days. Sri Lanka, situated midway between China and the Mediterranean where powerful empires flourished during the pre- Christian era, served as a favourite port of call for the ships that travelled between them. It emerged as transit point for the fleet of Chinese boats carrying silk and ceramic ware and the Arabian vessels transporting spices from eastern countries to the African and Mediterranean empires. Sri Lanka became an important landmark on the famous silk and spice routes. Sri Lanka also emerged as the centre where Indian merchants exchanged goods with their counterparts from China, Arabia and Africa. Jataka stories make several references to the voyages of Indian merchants to Sri Lanka. Sri Lanka became a supplier of spices, gems, pearls, conch, ebony and elephants. Spices, incense, gems and pearls were exported to Africa and the Mediterranean countries. Elephants, ebony, conch and pearls were in great demand in India. Cinnamon was in use in ancient Egypt in about 3500 BP suggesting that there were trading links between Sri Lanka and Egypt. Three ports of Sri Lanka are mentioned in the Mahavamsa, the semi-historical text of the Sinhalese: the ports of Mahatittha, Jambukola and Gokanna. Mahatittha is the Pali name for Mattoddam. In ancient Tamil literature it is referred to as Manthai. According to Prof. W.I. Siriweera, Mattoddam was the most important port of Sri Lanka. The port which was located at the mouth of Aruvi Aru (Malwatu Oya in Sinhala) in the Mannar district was on the silk and spice routes. The existence of pearl fisheries around this area also contributed towards its commercial activity. It was also an important port for vessels coming from India and there was strong presence of Tamils in the area during most parts of history. The Mahavamsa says that Vijaya’s second wife who was from the Pandiyan royal family landed at Mattoddam. A large number of articles of foreign origin including coins and porcelain-ware have been excavated in the environs of this port. Fragments of Roman pottery, coins and other artefacts have been found. In the Sangam Tamil literature Mattoddam is referred to as one of the greatest ports on the seaboard of Sri Lanka and India. (C. Rasanayagam - Ancient Jaffna P. 14FF). One of the poems included in the Sangam anthology was by Eelattu Poothanthevanar from Manthai. Jambukola is the next important ancient port. The Mahavamsa refers to it as Jambukola Pattuna. It has been identified as Sambalturai, close to Kankesanthurai. It served as the port to North India, more especially to the port of Tamralpiti in Bengal. Envoys of King Devanampiyatissa set sail to the Court of Emperor Asoka from this port. (Mahavamsa ch. 19. v23). Theri Sanghamitta who brought the sapling of Sri Maha Bodhia of Gaya landed at Jambukola, and King Devanampiyatissa built the Jambukola Vihara outside this port to mark that historic event. Jambukola diminished in importance as Mattoddam gained prominence. Mahavamsa also mentions the port of Gokanna. It records that Panduvasudeva landed at the mouth of the Mahakandara river. It also says that Badhahakacayana landed at Trincomalee. This eastern port served as the port of call for vessels coming from the eastern and far eastern countries. Mahavamsa says that King Mahasena built a Buddhist Vihara after demolishing a Hindu temple (The Mahavamsa ch 37,v.41) The Culavamsa also refers to this port. Though not mentioned in Mahavamsa Urkavalthurai or Kayts is an old port which was mentioned in Pali and Tamil literatures. The Pali work Abitta Jataka refers to the Brahmin sage Akitta (Agastya) who had visited the island of Kara adjacent to Nagadipa. This is identified by some as the present Karaitivu or Karainagar. Manimekalai, one of the five great epics of Tamil literature, refers to a place called Manipallavam which might be Nainativu . Humans are known to have lived in various parts of India during the last one million years. During this period Sri Lanka was connected to India on several occasions. Dr. S.U. Deraniyagala has postulated that humans would have migrated to Sri Lanka during those periods. Findings at Iranaimadu indicate the existence of settlements of prehistoric people in Sri Lanka as early as 300,000 years ago. Archaeological excavations conducted in the coastal deposits near Bundala provide definite evidence for the existence of human settlements 125,000 years ago. The discovery of the hand-axes and scrapers of quartz and chert used by the people who lived in those settlements show they were hunters and gatherers. Positive information is available about prehistoric human settlements during the period 37,000 years to 6500 years before the present (BP). About 50 sites in which people lived have been studied. Those sites are collectively termed Balangoda settlements and the people who lived there are referred to as Balangoda Man and their culture is called Balangoda culture. There are three major caves in this area, the oldest, Fa Hien-lena, starts 37,000 years ago. The second, Batadomba-lena, starts around 31,000 years ago and the third, Beli-lena, around 30,000 years ago. These caves have produced evidence of stone tools. Bone remains of humans and animals and charcoal have been preserved in good condition. Balangoda male was about 174 cm tall and female around 166 cm. Their bones were robust, with thick skull-bones, prominent brow-ridges, depressed wide noses, heavy jaws and short necks. The teeth were conspicuously large. The recent discovery at Pallemalala, Hambantota provides evidence for the existence of human settlements in the late stone stage, about 5000 to 6000 years before present. Skeletons of eleven persons buried in folded position had been unearthed and researchers feel that they belonged to a settlement of about 15 people. A large grinding stone and evidence of a fireplace were discovered. A large number of stone tools and animal bones have been found. Experts say that the animal bones look like they had been discarded after consumption of the marrow. Tools carved out of animal bone were also found here. Archaeological evidence of the people who lived during the period of transition from the late stone age to the beginning of the Early Iron Age (EIA) is scarce. A human skeleton found at Godavaya in the Hambantota district has been dated to belong to the period 3000 to 5000 BP. Tools made of animal bones and stones were found near it. Excavations in the cave of Dorawaka-kanda near Kegalle indicate the use of pottery and stone stools. It is dated 4300 BP. Slag found at Mattoddam indicates the knowledge of copper-working. It was 1800 years old. The way of life of the people underwent a major change with the introduction of iron implements. Archaeological research shows that EIA culture had established itself in Tamil Nadu by about 3200 years ago. It spread to Sri Lanka during the period 3000 to 2800 years ago. Sudharshan Seneviratne, a leading authority on the subject of the origin and spread of EIA culture in South India and Sri Lanka, says that EIA culture first established itself in the southeastern plains near the estuaries of Tambaraparani, Vaigai, Kaveri, Ponni and Palar and their tributaries in Tamil Nadu before it crossed over to the northwestern coast of Sri Lanka watered by the rivers Aruvi Aru (Malwattu Oya), Kal Aru, Modaragam Aru, Elapat Aru (a tributary of Kala Oya) and Kala Oya. Seneviratne says that Sri Lanka received its impetus mainly from the Tambaraparani- Vaigai plains, the Pandyan territory. Indrapala who confirmed this view says there was constant interaction between the people living in the southeastern coast of Tamil Nadu and the northwestern coast of Sri Lanka, the coast between Puttalam and Mannar. The earliest discoveries of EIA settlements of Tamil Nadu were from the Pandyan territory, Adichchanallur and Perumbur where those settlements were discovered. They are on the banks of the river Tambaraparani which flows into the sea at Pamban. Pomparippu where the EIA settlement was discovered first in Sri Lanka was near the mouth of Kala Oya which is almost opposite Adichchanallur. A significant concentration of EIA settlements was located between Kala Oya and its tributary Elapar Aru. Archaeologists have discovered seven EIA settlements in the coast between Aruvi Aru and Kala Oya, the region that falls within the Wilpattu National Park area. Archeological research has now firmly established the existence of constant interaction between the EIA settlements of Tamil Nadu and Sri Lanka. Seneviratne says that the culture and the way of life of the people of the Tamil Nadu and Sri Lankan settlements were similar. Distinct similarity exists in paddy cultivation and burial. The EIA culture, archaeologists estimate, brought immense change in the way of living of the Sri Lankan people. With that came cattle, horses, paddy cultivation and pottery. Iron technology helped the people to bring larger area under paddy cultivation and increase the yield. Recent research initiated by Jaffna University has established that the spread of the EIA culture extended further north of Aruvi Aru. 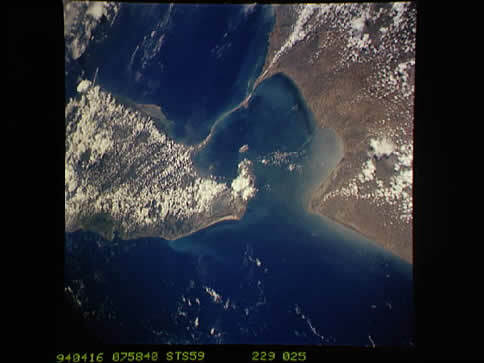 Most of the findings were from Poonari and the islands off the Jaffna peninsula. P. Pushparatnam has reported the discovery of EIA settlements in Mannitalai, Kalmunai, Vettukadu, Pallikuda, Pallavarayan, Ilavur and other places in the Poonari area in the mainland. Archaeological discoveries show that human settlements existed in the Jaffna peninsula, especially in the islands. The skeletal remains of humans and the artifacts found in the burial sites, especially the pottery with graffiti symbols and the tools, show that people had led a settled and civilized life before the advent of the Iron Age. Evidence of the EIA culture is gradually emerging. Pushparatnam excavated in September 2004 a new EIA urn burial site in Catti in Velanai. The offshore islands, particularly Nainativu (Nagadeepa), Karainagar and Velanai appear to have played an important part in the spread of the EIA culture into the northern part of Sri Lanka. Some other EIA burial sites have also been discovered in the Jaffna peninsula in the last two decades. In Kantarodai, the only site with radiocarbon dates which reveal the existence of human settlements as early as 2600 years ago, no burials have been unearthed. In Anaikoddai which was excavated by a team led by Indrapala in 1980, several burials were discovered. A seal found in it has been dated to 2200 years ago. Subsequently, P. Ragupathy discovered other burial sites at Karainagar and Velanai. Jaffna University is planning to survey the Jaffna peninsula, particularly the islands, since its researchers are convinced that EIA cultural spread branched off to the north as it reached the northwest. Indrapala says that Karainagar, Nainativu and Velanai played an important part in the spread of EIA culture in the Jaffna peninsula. Archaeological evidence for the beginnings of the Iron Age in Sri Lanka has been found at Anuradhapura, where a large city–settlement was founded before 2900 years ago. Then the settlement was about 15 hectares. By about 2700 years ago it had expanded to 50 hectares. A similar site from the same period has also been discovered near Aligala in Sigiriya. Pali chronicles the Dipavamsa and Mahavamsa speak about four tribes that lived in Sri Lanka when Vijaya arrived 2553 years ago (543 BC). The tribes were: Yakkha, Naga, Deva and Raksasa. Of these the Ramayana mentions the Raksasa and Deva tribes. They lived in the central part of Sri Lanka. According to the Ramayana they governed Sri Lanka 4380 years ago. Ramayana speaks about the Raksasa kingdom of Sri Lanka and its capital Lankapura, which it describes as a well-planned and prosperous city. Ramayana says that the people who lived in it were highly civilized. Ramayana adds that the Raksasa kingdom situated in the central highlands of Sri Lanka was established by Kubera. His step- brother Ravana later took it over. Ramayana narrates the story of the abduction of Rama’s wife Sita by Ravana and her rescue by Rama in detail because it forms the core of the tale. It speaks about the construction of a land bridge, Ram Palam (Adam’s Bridge), by Hanuman between Rameswaram and Mannar which enabled Rama and his army to cross over to Sri Lanka. Ramayana depicts Ravana as a devote Hindu who worshiped Siva, a great scholar, a capable ruler, a maestro of the Veena, author of books on medicine and astrology and an expert in many arts and a skilled military strategist. The Indian epic extols the beauty of Lankapura and its administrative structure. 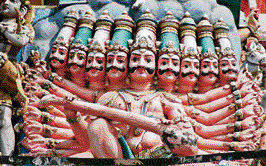 Ravana is depicted as a person with ten heads. Various explanations have been offered by scholars. The common explanation says that he possessed the strength of ten persons. Another was that he possessed thorough knowledge of the four Vedas and six Upanishads. The Sinhala historical tradition, Ravana Vamsa Valiya, traces the history of Sri Lanka from Ravana. Some books and several articles were written by Sinhala scholars and historians in recent times in support of that claim. Several scholars have located the names of the places mentioned in Ramayana. Sirancee Gunawardene has identified the various places where Ravana held Sita during the period of captivity. He first held her inside Ravana Kite on the Southeastern coast. Then he took her to Sita Elisa. When Rama’s army advanced he took her to Ravana Ella cave which is about ten kilometers from Bandarawela. Several other places mentioned in the Ramayana have also been identified. Some scholars use the identification of the places to argue that the Ramayana story is based on an actual event. Ramayana also contains reference to Nagas. Rama while sending Hanuman to Sri Lanka to search for Sita told him look for her in the capital of the Naga kingdom. The northern Naga kingdom was then under Ravana’s rule. After Ravana’s defeat no information is available about the Raksasa tribe. They would have been subjugated by the Deva tribe which also lived during the same period and in the same region. Mahavamsa refers to the Devas in connection with their meeting with Buddha and conversion to Buddhism. It says that Sumana Saman, a leader of the Deva tribe came out of the central hills and met Buddha at Mahiyangana. Buddha gave him a few hairs from his head which were placed in a golden urn and enshrined in a sapphire stupa. Devas are believed to be the guardians of the mountain named Adams Peak. Yakkhas and Nagas were the two tribes that lived in Sri Lanka when Vijaya and his followers landed in Sri Lanka. Yakkha people lived in the southern and central parts of Sri Lanka while Nagas occupied the western and northern portions of the country. Yakkhas lived from about 8000 years to 5000 years before the present. The Yakkha had great skill in the construction of irrigation tanks. They were also great iron craftsmen and their smiths sold steel to the Arabian countries for sword making. They worshipped the sun and celebrated the annual New Year festival. Mahabharata, the second oldest Indian epic, has a reference to the Naga tribe that ruled the northern part of Sri Lanka. In its account of Arjuna’s pilgrimage to the southern shrines and holy waters he crossed over to Sri Lanka to take a bath at Keerimalai and worshiped at one of the ancient Saiva temple Naguleswaram. He married a Naga princes. Mahabharata mentions Nagas as a highly civilized people living in India and Sri Lanka. Mahavamsa refers to the Naga chieftaincies of Kalyani and Nagadeepa. Kalyani was situated in western Sri Lanka on the banks of Kelani river and Nagadeepa in the north, an island off the Jaffna peninsula. Possibly, other Naga chieftaincies existed along the northwestern coast between Puttalam and Nagadeepa. Archaeological finds of Poonari suggests it. Archaeologists have determined the area north of Aruvi Aru (Malwattu Oya) as Naga territory. The Nagas were a prominent race in India and their names are still extant in various parts. Some countries in South East Asia, especially Cambodia, claim Naga origin. Whatever their origin, Rasanayagam says, a Naga kingdom did flourish in the north of the island from 8000 years to 1700 years before the present (300AD). Ptolemy, the famous Greek geographer and astronomer who lived between 85 AD and 165 AD and travelled around the world refers to Naga kingdoms on the Coromandel coast and points out the place-names, Nagoor and Nagapatinam, in support. The fact that EIA settlements of Tamil Nadu and the northern Sri Lanka which bear similarities show that the early settlers of the north were Naga people. The Nagas were good sea traders and Ptolemy observed that one of the oldest seaports of the Island was in the Northern part of the Jaffna Peninsula. They worshiped serpents, which is in the icon of Lord Siva. Hindu sculptures depict Siva wearing a serpent around his neck. The occurrence of a large amount of personal names with the element Naga in the earliest cave inscriptions indicates their presence in different parts of the country. Names of six of the ten kings who ruled Anuradhapura between 135 AD and 248 AD, a period of 113 years have Naga in their names. Map showing the locations of the five ancient Sivan temples known as Pancha Eswarams. The important find of a statuette of Lakshmi, the Hindu goddess of good fortune, in the Anaikoddai excavation confirms other evidence that the Naga people were Hindus. The Nagas' religious practices still prevail among the Hindus and Buddhists. They worship serpents by offering milk and eggs. They do not keep garuda’s (falcon) pictures in the house because it is an enemy of serpents. Hindu tradition maintains that the people, Yakkhas and Nagas, who lived during the pre- Buddhist era, were worshipers of Siva. The existence of five ancient Sivan temples around the island supports that belief. They are Thiruketheeshwaram and Muneshwaram in the West, Thondeshwaram in the South, Koneshwaram in the East and Naguleshwaram in the North. Mahavamsa seems to support the view that Yakkhas and Nagas were Hindus before Buddha converted them to Buddhism. The Buddha visited Sri Lanka on three different occasions, according to this text. His first visit was to Mahiyangana; the second to Nagadeepa, and the third was to Kalyani (Kelani). The Buddha's first visit took place on Durutu (January) Full Moon Day (528 BC), ninth month after He attained Enlightenment. He visited the Mahanaga Garden in Mahiyangana in central Sri Lanka where the Yakkhas who lived in the entire island met. Buddha entered that assembly, preached his sermon and converted them. 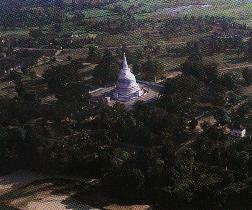 The Mahiyangana stupa stands at the very spot Buddha sat. Buddha’s second visit took place in the fifth year of His Enlightenment (523 B.C.). He visited Nagadeepa to settle a dispute between the Naga kings Culodara and Mahodara, uncle and nephew, over a jeweled throne and settled the dispute preaching the sermon on compassion. His third visit took place in the eighth year after his attainment of Buddhahood (520 BC) He visited several places. He began His visit with Kelaniya, whose king Maniakkhika had invited Him during His visit to Nagadeepa, then went to Sripada where He placed his footprint, and went to Digavapi and then to Anuradhapura and sat and meditated in a place where the Bodhi tree now stands. Buddhists believe that Buddha visited the places where the following stupas stand: Mutiyangana stupa in Badulla, Tissamaharvihara, Maricavatti or Mirisavati stupa, Jetavana stupa, Abhayagri stupa and Kirivihara at Kataragama. 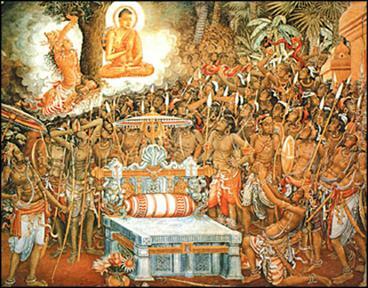 Though historians dispute the veracity of Mahavamsa’s account of Buddha’s visits they have become an ingredient of the belief system of the Buddhists, including Tamil Buddhists, since ancient times. Manimekalai, one of the Tamil epics written in the 2nd. Century, talks about Buddha's visit to Manipallavam which is identified as Nagathivy (Nagadeepa).